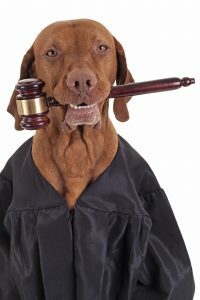 While acknowledging that dogs are treated as members of the family, a Saskatoon (Canada) Judge has emphatically refused to view a divorcing couple’s dispute about pet ownership as a child custody case. “To consume scarce judicial resources with this matter is wasteful. In my view such applications should be discouraged,” he added. The judge also wisely got in front of the old “Dogs are property under the law, viewed just like an old table or can opener!” canard by pointing out that we are most certainly not legally entitled to treat them (or other pets) in a cruel or neglectful manner. Of course we all love our pets and consider them part of the family, but from a legal standpoint, we couldn’t agree more with the judge that claims like this are a waste of time, talent, and resources. If you are reading this blog, you no doubt know at least a few veterinarians (or hey, maybe you are a veterinarian! ), so do a quick mental survey and ask yourself: do you know anybody — anybody — who pursued the profession out of a desire to “butcher” or “mutilate” animals? Think hard now! OK, didn’t think so. As with any profession, veterinarians differ in skill, experience, and temperament, but you are going to be extremely hard-pressed to find one who doesn’t care deeply about healing animals and improving their quality of life. 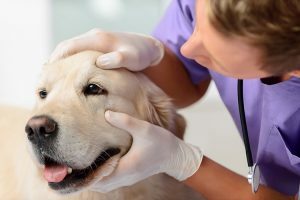 The simple fact of the matter is, if somebody is willing to commit the kind of time and energy it takes to become a veterinarian, they probably like animals. This doesn’t stop detractors from assuming bad intentions or cruelty on the part of veterinarians, or even smearing their reputation, however: according to the American Veterinary Medical Association (AVMA), 20% of AVMA members report that they have been cyberbullied or received false reviews. Cyberbullying and false claims doesn’t merely harm on a professional level, they are psychologically damaging, and in at least one tragic instance, harassment was a contributing factor in a veterinarian’s suicide. This is a lot more serious than a snarky Yelp review. So to address this growing issue, the AVMA has responded by launching a new hotline and reputation management service to help veterinarians fight back against cyberbullying. Having worked for more than a quarter century educating the public on the difference between animal rights and animal welfare, having exposed deceit and hypocrisy on the part of animal extremists, it’s safe to say we know a little something about how nasty and personal things can become in the world of animal ethics. 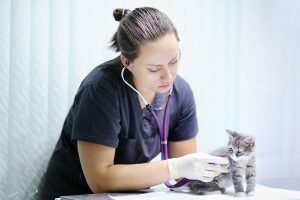 It remains to be seen how effective these programs will be at protecting veterinarians from abuse and false reviews, but addressing the issue itself is essential, and we hope the AVMA is successful. As veterinarians serve animal owners and their animals in the public square, they are just as vulnerable to malicious behavior by those with an agenda, as is anyone else. While thoughtful people may disagree on what constitutes good public policy, or proper animal care, no one should be subject to personal attacks online or otherwise. Unfortunately there are those in our society who may act thoughtlessly or unkindly towards those they may disagree with, or those who they feel may have wronged them. In today’s digital world, cyber-bullying is a favored tactic for those individuals. I am proud that the AVMA, my national professional society, has been and continues to be a leader in providing its members, my colleagues, with the resources necessary to protect themselves from unfair and unkind online attacks. As such, AVMA provides its members a hotline as well as on demand reputation management counseling. For this reason, and so many others, every veterinarian should be a member of AVMA. AVMA stands up for the veterinary profession. Congratulations to NAIA Board Member Dr. Robert Speth! 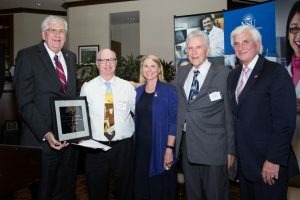 Big congratulations are in order for Nova Southeastern University (NSU) professor of pharmacology, bioethicist, and NAIA Board Member Dr. Robert Speth, who just received NSU’s Sixth Annual Provost’s Research and Scholarship Award! Dr. Speth has distinguished himself as a researcher, an educator, and a staunch supporter of the NSU community. He has truly demonstrated what this award is meant to recognize: innovative and sustained activities in support of NSU’s mission to foster intellectual inquiry, academic excellence, research and a dynamic learning environment. Photo caption (left to right): Ralph V. Rogers Jr., Ph.D., NSU executive vice president and provost; Robert C. Speth, Ph.D.; Lisa Deziel, Pharm.D., Ph.D., dean, NSU College of Pharmacy; Stanley Cohen, Ed.D., nominator; George L. Hanbury II, Ph.D., NSU president & CEO. Dr. Speth’s is known for his work studying brain receptors for neurotransmitters and hormones. He focuses on the hormone angiotensin, which causes hypertension. His research has shown that receptors for angiotensin in the brain are strategically located to stimulate nerves that act upon the cardiovascular system to raise blood pressure. 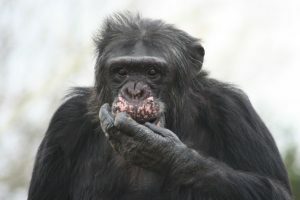 He is also widely recognized as a resource on the ethics of animal research. We are proud to have Dr. Speth as a board member, and thrilled to see him receive this prestigious reward! Just a quick shout-out here for the veterinarians and other experts in Canada who are speaking out on the risks associated with willy-nilly dog importation. “We are actually enabling a problem elsewhere because people need to learn to spay and neuter their dogs and how to help the overpopulation of dogs,” the veterinarian said. Of course, solving issues like this is much harder than outlining a good plan, but recognizing a serious issue and taking a firm stand is an excellent start! NAIA Trust is excited to announce the addition of Sara Chisnell as the Legislative Director. Ms. Chisnell is a Michigan based attorney with an extensive background in animal law. Sara’s role with NAIA Trust will focus on expanding state and federal outreach by promoting reasonable laws, policies and regulations to protect animals and the people who care for them. Sara has successfully petitioned for moderate animal-related laws at a grassroots and national level. She was previously involved with NAIA through National Conferences and various legislative issues where she connected with NAIA President, Patti Strand. “One of Sarah’s greatest assets is that she’s an animal person. She’s heavily involved in the animal world in all aspects of her life. This is an enormous strength when working with animal related legislation,” Patti says of Sara. Sara graduated from Otterbein College with a BA in Equine Science. She then went on to Michigan State University College of Law, where she focused on animal law. 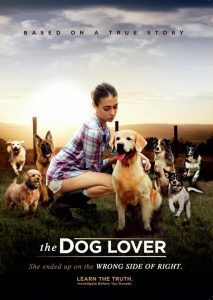 Sara spent nine years with the United Kennel Club (UKC) focusing on canine legislation. She also served as in-house counsel and the representative for pointing breeds. 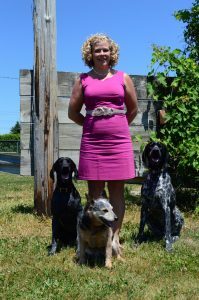 Ms. Chisnell is active in the North American Versatile Hunting Dog Association, and regularly trains and tests her German Shorthaired Pointers in Hunting Retriever Club. She is passionate about canine performance sport, in particular dock diving. She also trains young horses in basic dressage for a Warmblood breeder. NAIA Trust is a 501(c) (4) organization. 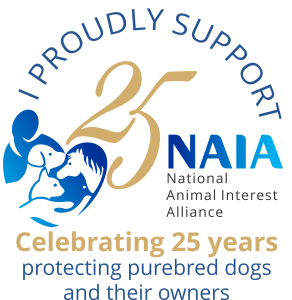 The Mission of NAIA Trust is to promote the welfare of animals, strengthen the human-animal bond and safeguard the rights of responsible animal owners, enthusiasts and professionals through education, legislation and the courts.